What age is eligible to play? > Under 24 during the full year of the tournament. The WU24 is open to all players who are fourteen (14) years old or older and do not turn twenty-four (24) during the calendar year 2019. The year born is relevant! If a Player was born in 1995 he or she will turn 24 in 2019 and is NOT under 24 years of age the füll year of the tournament. Players born in 1995 are NOT ELIGIBLE!!!! Players Born in 1996 and later are eligible. males and three (3) females. WFDF Game Advisors will be used for some games at this event, including all finals. 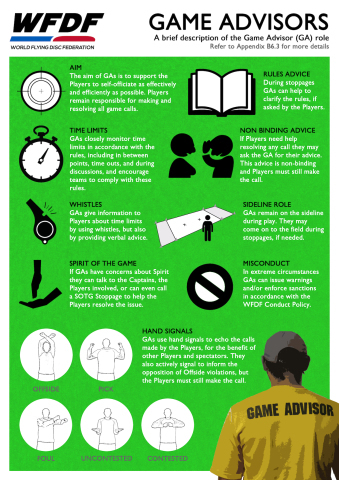 You can find out more information about Game Advisors here.